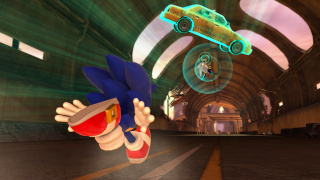 Silver the Hedgehog's rival battle in Sonic Generations takes place on the destroyed highways in Crisis City as seen in Sonic the Hedgehog (2006). Throwing one object at Sonic. To avoid, just move out of the way. Psychic waves, which can go either horizontal or vertical. To avoid, jump or Quick Step out of the way. Collecting numerous objects and hurling them consecutively at Sonic. To avoid, move out of the way. Picking up three objects and slamming them down on Sonic. He does this in different combinations every time he does the move, so stay on your toes. To avoid, move away from the spinning objects, or get crushed. Collecting everything into a huge heap and lunging it at Sonic. You can jump on top of this and run on it to get close. The way to hurt Silver is by Homing attacking him when you get close. This can be by either home attacking any objects he has levitated to reach him, or by simply getting close enough that the homing reticule appears on him. On his final hit, he will create a giant meteor of garbage and throw it behind you. Keep up your speed, and while dodging him throwing more things at you, home attack him once more to put him out of commission. You will earn a Chaos Emerald for your efforts.